In an early episode of scholar Peter Labuza’s podcast The Cinephiliacs, critic/programmer/filmmaker Kent Jones laments what he sees as an unfortunate tendency in film culture: namely, the inability of audiences to “confront a movie head-on.” Jones observes that rather than “looking at and describing” a work on its own terms, cineastes often resort to “diversionary gestures,” such as “judging” a film against other titles (either within a director’s oeuvre or a particular genre more broadly) and then “categorizing” and “hierarchizing” it among them. Lost in this discourse, amongst idiosyncratic issues of timing, politics, morality, and taste, is the individual and unique film itself. There may no more perfect example of what Jones is talking about than the reception that greeted John Carpenter’s out-and-out masterpiece The Thing when it arrived in theaters 35 ago this summer. The second Hollywood adaptation of John W. Campbell, Jr.’s novella Who Goes There? (first was 1951’s Howard Hawks-produced The Thing from Another World), the film tells the story of a group of American researchers in Antarctica who have especially close encounters with a stranded, hostile alien that can assimilate and perfectly imitate any living being. 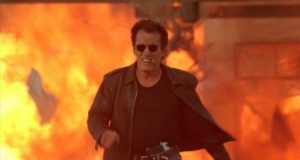 Despite being a studio tentpole with a first-rate cast of character actors (including headliner Kurt Russell, Wilford Brimley, Keith David, Richard Dysart, and Donald Moffat) and impeccable production values all around (among them, an Ennio Morricone score and cinematography by Dean Cundey), the film was excoriated by critics and opened a paltry #8 at the U.S. box office. 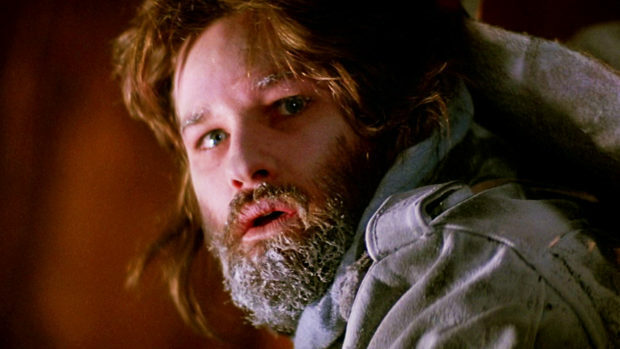 Many (including Carpenter himself) have attributed this woeful reception to the timing of the film’s release: the contrast between The Thing’s foreboding chills and Steven Spielberg’s upbeat crowd-pleaser E.T. : The Extra-Terrestrial (1982), to whom audiences had been introduced just two weeks prior, was very stark indeed. As a result of this scheduling, critics inevitably wound up comparing the two radically divergent films. Not all of them were entirely transparent about that, however: Vincent Canby doesn’t mention E.T. anywhere in his New York Times review of The Thing, for example, but was it really just a coincidence that only days after rhapsodizing about the former, calling it “wise,” “full of the timeless longings expressed in children’s literature of all eras,” and “beautifully realized” in terms of its special effects, which he dismissively dubbed the latter “a foolish, depressing, overproduced movie”? Carpenter, an avowed Hawks acolyte, was also denigrated for putting his own subversive spin on Campbell’s story and not slavishly imitating his idol’s approach. Carpenter’s Thing is shown early, often, and in good light, flouting the “classical” Hollywood convention of insinuating monsters with shadows, music cues, and reaction shots. Today, this decision comes across as a necessary and admirable change of style, but few saw it that way then. In the Chicago Reader, for example, Dave Kehr complained, “John Carpenter’s only official remake of a Howard Hawks film turns out to be his least Hawksian effort.” The Thing is, in fact, neither Hawksian nor Spielbergian; it is its own distinctive experience of horror, and very few seemed to want to confront that head-on in 1982. However, time has allowed audiences to meet the film again for the first time; to say that The Thing has received substantial critical reappraisal over the years would be putting it mildly. In 2015, it came in at #1 on the Boston Globe’s list of the “50 Scariest Movies of All Time,” ahead of such usual suspects as The Exorcist (1973), The Shining (1980), Night of the Living Dead (1968), Psycho (1960), Alien (1979), Jaws (1975), and The Texas Chainsaw Massacre (1974). The BFI Film Classics series also now includes a volume on The Thing, authored by critic and novelist Anne Billson. In addition, many notable auteurs have publicly heaped praise on the film, including Olivier Assayas, John Sayles, Bong Joon-ho, and Edgar Wright. Looking at it now, thirty-five years later, The Thing does, in fact, seem like the best exemplar of a hugely influential director’s gifts. Of course, Carpenter’s ingenuity has always set him apart from the rest of the B-movie pack; even from the earliest days of his career, with films like Dark Star (1974), Assault on Precinct 13 (1976), and Halloween (1978), he was forging new paths in genre filmmaking. 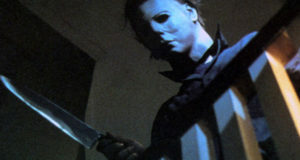 Halloween’s innovation of showing a murder from the killer’s subjective point of view, for instance, went on to become a well-worn slasher movie trope precisely because the effect was so potent in that film. However, these initial accomplishments can feel a bit like dry runs for The Thing, which evinces the self-described “horror master” operating at peak performance. By way of illustration, Carpenter is able to set a singularly disquieting mood right from the film’s outset using only the unlikely combination of Morricone’s score and a handful of shots following a helicopter’s daylight pursuit of a snow dog across the remote expanse of Antarctica. On paper, this scene in Bill Lancaster’s script probably didn’t read like it was guaranteed to immediately strike fear into the hearts of moviegoers — unlike, say, one that starts with a masked killer, a kitchen knife, and All Hallows’ Eve — but such were Carpenter’s abilities by this point. Not coincidentally, The Thing also comes right smack-dab in the middle of the period during which the director’s aesthetic really crystallized. Carpenter’s first few films, while very strong, are not just overtly but also perhaps overly influenced by directors like Hawks and Alfred Hitchcock. By the 1980s, though, he had come into his own with idiosyncratic efforts such as The Fog (1980), Escape from New York (1981), Christine (1983), Starman (1984), Big Trouble in Little China (1986), and Prince of Darkness (1987) They Live (1988). To be sure, most of the Carpenter hallmarks now being emulated by contemporary “post-horror” directors like David Robert Mitchell (It Follows, 2015), Jordan Peele (Get Out, 2017), Trey Edward Shults (It Comes At Night, 2017), and Ana Lily Amirpour (A Girl Walks Home Alone At Night, 2014) can be traced to this “mid-career” section of his filmography. But it’s with The Thing in particular that his formal predilections and thematic preoccupations come most strikingly to the fore. A big part of this has to do with how well the source material and the director complement each other, even in subtle ways. Carpenter’s characteristic way of working with color, for example, adds a wonderfully ominous wrinkle to this monster story: he often introduces a sharp contrast into an established color scheme as a way of destabilizing the audience (e.g. black-and-white in They Live and glowing green in Prince of Darkness), and this turns out to be the ideal technique for underlining the threat of infection in The Thing. Bright red invades a very cool palette of whites, grays, and blues; as soon as the titular beastie starts assimilating and imitating, pink and purple hues creep menacingly into the cinematography. In a career distinguished in part by brilliant flourishes in color design, this might be the most beautifully integrated with the rest of the film. Similarly, Carpenter’s penchant for thoughtful-but-unfussy compositions gives The Thing a groundedness that boosts its impact enormously. As a veteran of low-budget productions, his visual style is very much informed by skills honed working on shoestrings: clever blocking of actors, uncomplicated (but not inelegant) camera set-ups, and careful attention to scene coverage. Carpenter’s body of work may seem rough-hewn compared to that of a “Movie Brat” like Spielberg, but the unadorned quality of his oeuvre has almost always been a boon: for one thing, it lends a straightforward and unpretentious air that goes a long way towards engaging the audience. Indeed, if The Thing feels like it really gets down to business, without all the froufrou that usually comes with big-budget productions, it’s because that’s the director’s stock-in-trade. While it is the handsomest of all the director’s productions, The Thing is no exception in terms of its content. Here, the denizens of Outpost 31 are evenly split between “upstairs” and “downstairs” types: the elites comprise station commander Garry (Moffat), biologists Blair (Brimley) and Fuchs (Jared Polis), geologist Norris (Charles Hallahan), meteorologist Bennings (Peter Maloney), and physician Copper (Dysart); while the hired hands include cook Nauls (T.K. Carter), radio operator Windows (Thomas G. Waites), dog handler Clark (Richard Masur), mechanics Childs (David) and Palmer (David Clennon), and helicopter pilot MacReady (Russell). There are no women present, and the only people of color (Childs and Nauls) are workers. Carpenter makes his affinities known with a moment early in the picture: the square, whiny Bennings demands over the PA system that the roller-skating Nauls turn off the “crap” he’s playing on his stereo (Stevie Wonder’s irresistible “Superstition”). Nauls politely acquiesces, and then cranks up the volume with a defiant grin. With this gag in particular, it’s abundantly clear which of the research station’s castes the director finds more down-to-earth and relatable. To be fair, though, divisions in The Thing get blurry fast: at the end of the day, all of these men are stuck together on the same cruddy base in Antarctica, facing a common threat and dire circumstances. Furthermore, once things start going south, it’s not entirely clear that they’ve ever taken the chain of command that seriously: Garry is only too happy to cede his nominal leadership, and command falls to MacReady, the instinctive doer in the bunch. We get a few wild cards in the characterizations as well. Burdened by a quiet genius that enables him to comprehend what’s happening long before everyone else, senior scientist Blair emerges as one of the film’s most sympathetic characters, despite his high position in the social order. (Among other things, he sobs out of pity for the team’s assimilated snow dogs, and takes self-sacrificial steps to isolate the team and protect the rest of the world.) In addition, while MacReady is the closest thing we get to a hero, he’s quite a flawed one: a high-functioning alcoholic, his knee-jerk decision-making results in at least two unnecessary deaths. 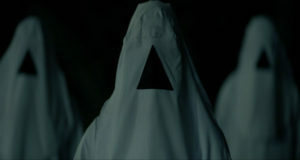 A less assured director might have opted for stock characters over rounded ones (see Matthijs van Heijningen, Jr.’s homonymous 2011 prequel), but Carpenter knows that the more recognizably human the men of Outpost 31 are, the more frightening the prospect of assimilation and imitation by the Thing will be. Fortunately, the cast ably rises up to meet their director’s challenge: working some realism into The Thing. Historically, Carpenter has been very accommodating with his actors, and this approach hasn’t always worked: because no one seems to be on the same page in his 1995 Village of the Damned remake, for example, there’s a jarringly broad range to the performances. 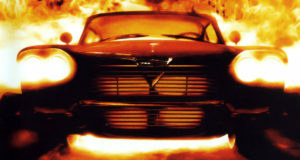 But this risky method has also paid off big time for the director: consider Jeff Bridges’s thoroughly audacious and indelible turn in Starman (which garnered him the first of many Oscar nominations for Best Actor) or James Woods’s breathtakingly unrestrained histrionics in 1998s Vampires (hands down the finest work he’s ever done). 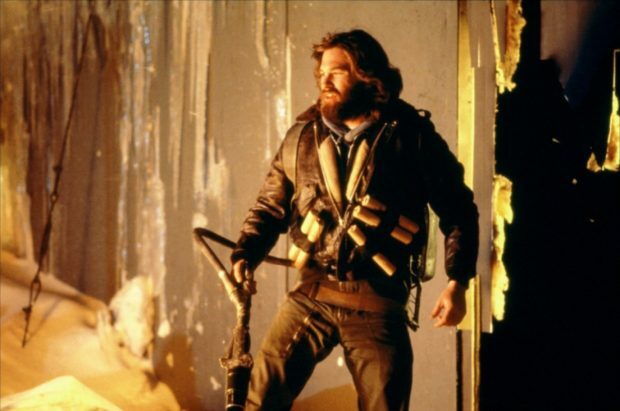 Carpenter’s decision to give The Thing’s actors a lot of room to work, even letting them develop their own character backstories, proves a masterstroke as well: each and every one comes through with a portrayal that feels familiar, lived in, and not at all hokey. Moffat, for example, is no stranger to playing ineffectual bureaucrats, but essays his least one-dimensional and most outstanding variation on the type with Garry. Russell too has offered up quite a few men of action, but takes full advantage of the opportunity to work in much darker shades; the haunted MacReady is still the high point of his distinguished career. 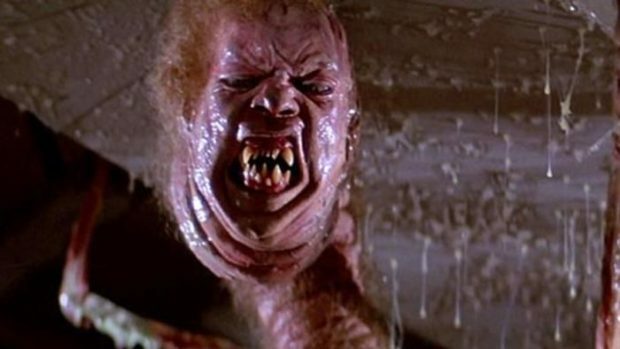 In addition to the cast, the script, and Carpenter’s direction, The Thing also has major assets in Rob Bottin’s virtuosic, sui generis creature effects. As staggering to behold today as they would have been in 1982, the various manifestations of the Thing are first-order works of art — absolutely petrifying, but also dynamically beautiful. “It could have imitated a million life forms on a million different planets,” says Fuchs in the scene that must have been Bottin’s inspiration; his Thing has a vast repertoire of presentations to draw upon, and it does. Depending on the moment, it appears insectile, botanical, crustaceous, humanoid, aqueous, serpentine, fungal and threadlike, or as an atomistic combination of some or all of these. What does the Thing look like? Anything and everything. It can’t be firmly pinned down and described, though, which also appreciably ups the fear factor. 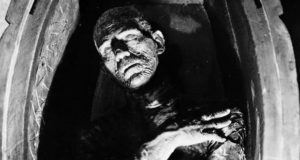 It’s worth pointing out that this decision by Bottin pushes incredibly hard against conventional wisdom when it comes to “creature features.” Almost without exception, movie monsters are represented iconically, and this requires giving them a very fixed set of features: from Lon Chaney’s Phantom of the Opera (1925) to Stan Winston’s Predator (1987), the pantheon of horror fiends tends toward ready identification. Promotional and merchandising considerations no doubt play a large role in this, so the fact that Bottin’s shape-shifting Thing resists standard illustration is kind of a big deal. (Over the years, companies like NECA and McFarlane Toys have certainly tried to capture and capitalize on it, though.) Truly, the special effects in The Thing are like nothing seen before or since. The corrosive paranoia that begins to overtake the community becomes palpable to the audience, even contagious. Carpenter skillfully creates a scenario in which the fears of those on- and off-screen become one and the same. There’s always some measure of this in effective horror films, of course (think, for instance, of how Wes Craven taps into the archetypal bad dreams we all share for 1984s A Nightmare on Elm Street), but it’s rare that characters become near-perfect surrogates for the audience. Here they do because extraneous details have been stripped away, leaving only substance that connects directly to the central terror of The Thing. As such, the uncertainties that plague Outpost 31 perfectly mirror the audience’s questions. Who can we be sure is human? Whose suggestions should be trusted? What course of action will keep stop the Thing and keep the survivors alive? As identification with the characters grows stronger, audience involvement gets ratcheted way up. In an early moment of tension, for example, Windows goes to pieces and questions the leadership of Garry: “You guys are gonna listen to Garry?! You’re gonna let him give the orders?! He could be one of those Things! !” Anyone watching the film might be wondering the very same thing at that point. Carpenter knows precisely how to reflect the audience’s experience, and for exactly how long to draw out all of the different mysteries; we’re kept on tenterhooks throughout The Thing because we are so expertly placed inside the characters’ snow boots. The overall effect of this film is uncommonly and incredibly unnerving. That any or all of these characters, no matter how “deserving” of death, could be assimilated and imitated by the Thing only adds to its impact. 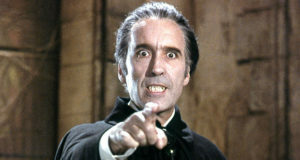 In fact, the monster is ultimately personified most in a character who is, in Hollywood parlance, especially “likeable.” An inferior film might have had the Thing take the form of an irritating, hubristic, or morally dubious character (as was the case in van Heijningen’s 2011 film), but Carpenter knows that it’s much more hair-raising if the Thing’s wily nature knows no boundaries of decency or pity. Carpenter also deliberately avoids giving us a full and clear forensic timeline. Much like MacReady investigating the decimated Norwegian base, we’re often left to our best guesses about the Thing’s handiwork. We don’t always know if the characters have reasoned things out correctly, which makes The Thing both that much spookier and eminently rewatchable. Who sabotaged the blood bank? When did the Thing assimilate the character who is outed by MacReady’s blood test? Was one character’s apparent suicide really a suicide? And what about that ending? There’s a cottage industry of internet theorists dedicated to answering these questions, and even the likes of Russell and Cundey have not been able to resist participating in all the speculation. However, there’s something really quite rattling about The Thing’s intentionally inconclusive qualities. For example, in one of the film’s eeriest flourishes, it is never made clear when exactly the Thing assimilates that aforementioned “likeable” character. At what point, then, are we meant to stop reading that character’s actions as virtuous, and start reading them as predatory? Similarly, when said character warns MacReady to “watch Clark,” is this because he’s still human, wants to help the others, and genuinely suspects Clark? This is a totally reasonable hunch that the audience is meant to share, after all. Or is this the Thing trying to confuse and misdirect the humans? It’s hard to tell, and because the protagonists are so often shown to be wrong, maybe we shouldn’t trust all of their conclusions vis-à-vis this character. For example, The Thing alludes to the strategy of mutually assured destruction in MacReady’s droll introduction, which sees him impassively destroy an electronic chess game (voiced by Adrienne Barbeau) after it checkmates him. There are further intimations of it when he sums up the survivors’ situation and the task ahead of them, saying, “We’re not gettin’ outta here alive. But neither is that Thing.” Of course, the film’s ending also visualizes the doctrine in unforgettable fashion. The Thing is evocative of historic “Red Scares” and McCarthyism as well. Though The Thing from Another World (1951) was itself one of the many science fiction films of the 1950s to come out of Cold War angst, Carpenter’s film goes much farther than Hawks’s. There’s something awfully familiar about characters accusing other characters of being the Thing on the basis of little to no evidence. MacReady’s blood test, meant to suss out who is and is not who they say they are, is clearly meant to bring blacklisting to mind as well. 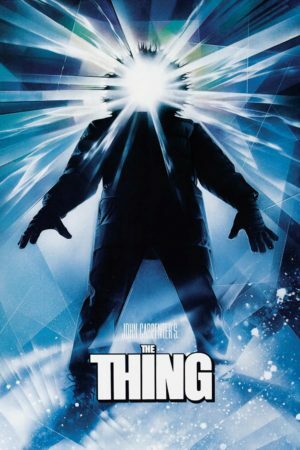 On the occasion of its 35th anniversary, The Thing is rightly being celebrated as a tour de force of genre moviemaking (with, among other things, a cast/crew screening at the Alamo Drafthouse, a new vinyl pressing of Morricone’s score, a coffee-table art book, and even a board game), but we would do well to remember to confront the film and the harsh truth it conveys head-on. Sadly, it may be that the film is even more relevant today than when it was first released: headlines and pundits instruct us to fear everything from ”suspected Russian agents” to “the P.C. movement.” If this is any indication, Carpenter is quite right that we “don’t trust each other anymore.” Granted, there are things we should legitimately worry about, guard against, and resist. But, as Carpenter tried to warn us, such wide-ranging and unending mistrust of one another is one of them. Carpenter has called The Thing an “end of the world” movie. In 1982, this is what the end of the world looked like to him. 35 years later, we’re drawing ever closer to it. Episode 3: Shock… Shock… Shock!!! Episode 2: It Comes To Life! An excellent analysis, and a very entertaining and interesting read. Makes me want to watch the film again asap. Holy Christ this was well written. Thanks so much!